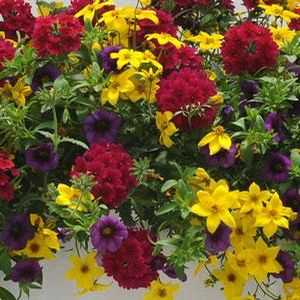 Our Trixi® 'Crazy for Crayons' Flower Combination is a combination planting inspired by the three primary colors an artist uses to mix their palette of hues for creating work of art: red, blue and yellow. 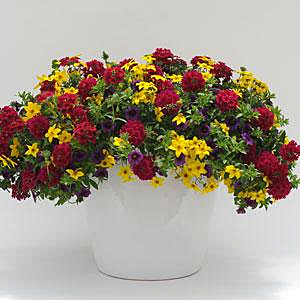 In addition, the different textures and forms were taken into consideration, the individual characteristics of Calibrachoa MiniFamous™ Royal Blue, Verbena Lascar™ Compact Burgundy and Bidens Namid™ Yellow combining to form an aesthetically pleasing masterpiece. Our 'Trixi Crazy for Crayons' plants are grown and shipped in fine quality growing medium and are guaranteed to arrive alive and ready to thrive.